In preparation for Sunday's Tea Party Pop-Up Shop event I've been perusing the Stella & Dot website picking out my favourite items. If you know Dress Me Dearly you know how much I love loud, fun, statement jewelry, so I'm loving these bold pieces from Stella + Dot's newest collections. I hope you'll join me at the event on Sunday, September 30th to sip tea, mingle and shop! We'll also be giving away an awesome prize package for people who RSVP to Callie_Dee@hotmail.com - so don't forget to RSVP! 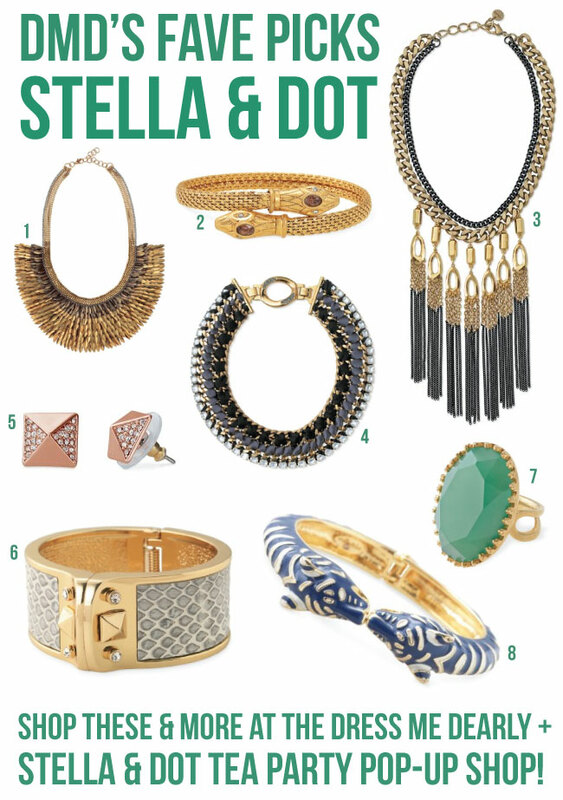 And Stella & Dot has announced a new giveaway for this event only! Orders over $100 will also be entered to win a piece from the limited edition Alice Temperley collection. Check out the behind the scenes video with the designer herself. And If you can't make it to the show, don't fret! You can order here to be entered.